Here in the US, Memorial Day is coming up soon—signaling the start of cookout season. And cookouts require potato salad. They just do. You could make an old favorite with white potatoes, of course. But why not try something different? Sweet potatoes—with their deep, rich flavor—work extremely well in potato salad. Add some chipotle to the mix, and you have a side dish that can stand up to any main course you slap on the grill. So make extra. Because your guests may walk right past the burgers or barbecue to load up on this. Some potato salads are mayonnaise-based (like American Potato Salad), while others are vinaigrette-based (think German Potato Salad with Bacon). Chipotle Sweet-Potato Salad takes the vinaigrette path. To make this salad, you need cooked sweet potatoes that have been chilled and cut into cubes of ½ to ¾ inch. There are several ways you to prepare them. You can peel the sweet potatoes, cut them into cubes, cook them in boiling water, then drain and cool them. To use this method, follow the general procedure described in Potato Salad Basics, substituting sweet potatoes for regular white ones. I find it usually takes 5 or 6 minutes to cook sweet potatoes using this method (depending on the size of the potato cubes), but start checking after 4 minutes—if you overcook the potatoes, they tend to crumble when you make the salad. Alternatively, you can boil the sweet potatoes in their skins (it’ll take maybe 20 minutes). Then cool them, remove the skins, and dice them. If you go this route, I find it works better to cook the potatoes a day ahead of time, then refrigerate them overnight before removing the skins. Or you can roast the sweet potatoes. For general instructions, see our post on Roast Sweet Potatoes. My recipe is adapted from one I found in Cheryl and Bill Jamison’s Smoke & Spice. This recipe serves 6 to 8 (but it can be scaled up easily). 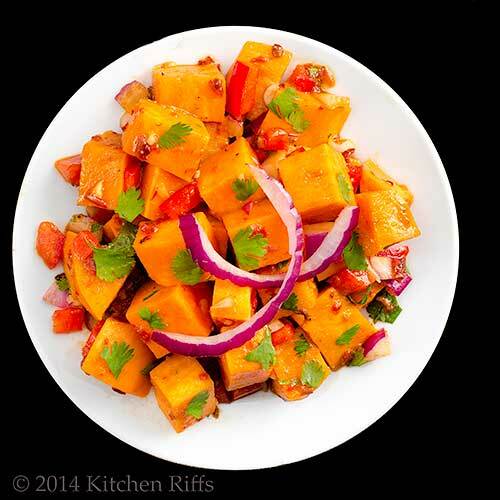 If you start with cooked, cubed sweet potatoes, this recipe takes 10 to 15 minutes to prepare. You can serve Chipotle Sweet-Potato Salad immediately, but it tastes better if chilled for a few hours (it’s even better chilled overnight). Leftovers keep for a few days if stored in an airtight container in the refrigerator. Place cooked, cubed sweet potatoes in a medium-sized mixing bowl (see recipe headnote for instructions on cooking sweet potatoes). Wash and dry the red bell pepper. Remove the core and white inner membranes, then chop the pepper into dice of ½ inch or less. Add to the sweet potatoes in the mixing bowl. Peel the onion and cut into small dice, then add the diced onion to the sweet potatoes and red bell pepper. Mix the ingredients together and set aside. Pour a 7-ounce can of chipotle chilies (including their accompanying sauce) into a mini food processor, then pulse until puréed. Place 2 to 3 tablespoons of the purée in a small mixing bowl—you’ll be mixing the vinaigrette in this bowl. (You may want to start with no more than 2 tablespoons of chipotle purée, then add more if desired; refrigerate the remaining chipotle purée in an airtight container—see Notes). Peel a clove of garlic and mince fine. Add to the chipotle purée. Add mustard, lime juice, and cumin to the chipotle purée and garlic, then use a whisk to blend the ingredients together. Taste, and add a bit of salt if needed. To complete the vinaigrette, slowly add the olive oil—drop by drop—to the chipotle purée mixture, whisking all the while. As an emulsion begins to form, you can dribble the olive oil in more quickly. Taste, and add a bit more lime juice, olive oil, or salt if necessary. Add the vinaigrette to the sweet-potato mixture you made in Step 3. Toss lightly until the dressing is well incorporated. Add the minced cilantro, and mix again. You can serve Chipotle Sweet-Potato Salad immediately, but it tastes better if it rests in the refrigerator, preferably overnight (in an airtight container). 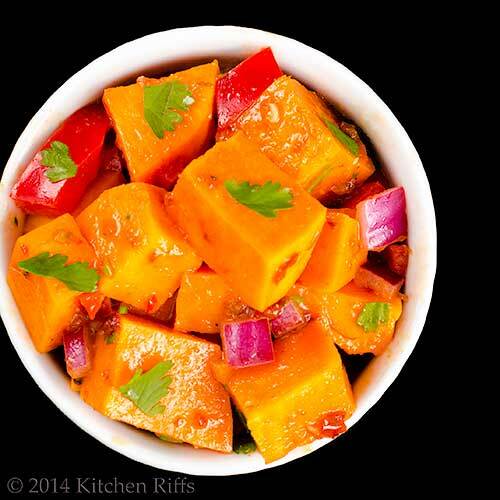 When you serve the sweet-potato salad, garnish (if you wish) with additional minced cilantro or thin slices of red onion. In the US, canned chipotle chilies tend to be sold in 7-ounce containers (most grocery stores carry them in their Mexican food sections). The canned chilies are packed in adobo sauce, which has a tasty vinegar base—so the sauce works well in our vinaigrette recipe. After you pulse the canned chipotle peppers in a mini food processor and measure out the amount you need for the recipe (Step 4), place the remaining purée in an airtight container and store it in the refrigerator. It will keep for weeks (even months, probably). Chipotle chilies are smoke-dried jalapeños. So they’re spicy (and can be hot on the tongue). If you’re not familiar with them, start with just 2 tablespoons of chipotle purée—or even less—when you make the vinaigrette. After you’ve finished mixing the vinaigrette (Step 7), you can always whisk in more chipotle purée if the dressing isn’t spicy enough for your taste. BTW, if you’ve recently made Shrimp in Chipotle Sauce, which we posted about back in April, this would be a great way to use some of the leftover canned chipotles from that recipe. Some people like a hint of sweetness in this dish. If that’s you, try adding a bit of honey or brown sugar to the vinaigrette. The original recipe calls for a tablespoon of ketchup (which would also add some sweetness). So you could try that too, if you like (though I haven’t). “Though I kind of fancy French Potato Salad,” said Mrs K R.
“Don’t forget dessert,” said Mrs K R.
And here at Kitchen Riffs Central, we don’t mess with tradition. I am a huge fan of chipotle peppers - love this salad where its combined with sweet potatoes! If the sweet potatoes were roasted - they would had even more sweetness to balance off the heat of the chipotles! Thanks for sharing this gorgeous, colorful and flavorful dish! It sounds like you two are going to have a great Memorial Day weekend BBQ! You've just combined two of my favorite flavors--sweet potatoes and chipotle--so I have to thank you for that. Thank you! I would be one of those folks bypassing the burgers to load up on this! You know how much I adore chipotle and what a fun way to switch up the potato salad routine! Your dishes always rock it, John. Hi Shashi, we love chipotles too! And they work so well in this salad -- this is one of the best things I've made this year! Thanks for the comment. Hi Ala, we take every opportunity to have a good time! Chipotles and sweet potatoes combine so well -- they're magic together. Thanks for the comment. Hi Kristy, it really is pretty easy to ignore the main event and just eat this for dinner! We did! ;-) Thanks for the comment. I admit I'm one of those who used to thing sweet potato equaled Thanksgiving fare and that was it. I've made the leap and use them so much more today and this salad is CRYING to me. No, it's actually BEGGING me to make it; wonderful combination of ingredients John. Hi Barb, we used to eat sweet potatoes only at Thanksgiving (and often Christmas) too. No more! We eat them throughout the year. They've become one of my favorite veggies. This is a great dish, IMO -- so much flavor. You won't regret making it. Thanks for the comment. Now this is my kind of potato salad! I love using sweet potatoes in a potato salad and of course the chipotle - great addition! I usually use powder, but I like your use of the canned peppers. That adds a richer and more robust heat I'm sure. And that simple dressing is just perfect! Great salad for grilling season John. Thanks! 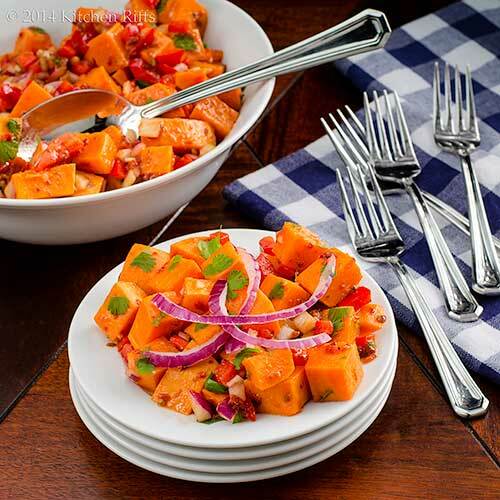 This looks like something we would really enjoy, John - sweet potatoes taste so good with a bit of added spice! I have found that freezing leftover chipotles works very well too. I have a special ice cube tray I only use for freezing things like this, so I just zap them up with the sauce and divide into likely sized portions and freeze in the trays. Then I pop them out into well-labeled freezer bags [don't want to get them mixed up with the liquefied berries for my smoothies!] - they keep for at least year like this. Time to get some of them out I guess! What a great potato salad, I love sweet potatoes and this is perfect for this grilling holiday coming up. Have not had a root beer float in years, remember now how much I used to enjoy them. Hi MJ, the powder is nice, but the canned chipotles really do add lusciousness. Thanks for the comment. Hi Donalyn, I've heard about freezing chipotles but have yet to try it. Great tip on keeping an ice cube tray just for doing that sort of thing. Thanks for the comment. Hi Cheri, this salad goes so well with grilled food. And root beer floats go well with anything. ;-) Thanks for the comment. Hi Nee, sweet potatoes make an awesome salad! Definitely worth a try, IMO. We'll be having a great Memorial Day, and hope you will too. Thanks for the comment. I need to stop thinking about sweet potatoes as a fall food! I would love this on my Memorial Day table! If I were a guest and spotted this dish, I would definitely opt to scoop up! I sometimes get bored of the usual dishes you see at certain events. This dish is something refreshing, healthy and is a treat to my palate! This could stand up to anything! I love chipotles and always have some in the fridge for moments like this! What a great list of Memorial Day favorites you have. I'm ready to cheer on summer! Hi Liz, sweet potatoes are great any time of the year. As this dish illustrates. ;-) I used to think of them as fall-only too, but they're so versatile. Thanks for the comment. Hi Julie, this is definitely a bit different from most potato salads. I love the spicy zing it has! Thanks for the comment. Hi Uru, isn't this nice? Tons of flavor. ;-) Thanks for the comment. Hi Abbe, this really could stand up to anything! Good idea to always have chipotles in the refrigerator -- you never know when you'll get a craving. ;-) Thanks for the comment. I make this with butternut squash and I ADORE IT! :) YUMM! Excellent party food. We have this and call it sweet potato hash. We usually have it for a brunch. The chipotle is a great addition and I will be adding it in next time I make this and I won't limit it to brunch. It is so flavorful. I hope you and the Mrs. have a lovely holiday weekend. Ahhh….yes. What’s not to love about these? I like all the ingredients but have never had the pleasure of mixing them all together!!!! why I haven't thought of this before??? This is a delicious side dish John, thank you. I love that flavour combo.... just exquisite! Love all the flavors! We love sweet potatoes. Sad, I don't make them as often. Thanks for sharing this yummy dish! Look at the colors! Beautiful. And spicy too. And Thanks for posting this. Hi GiGi, the butternut squash sounds like an excellent idea! I'll be stealing that. ;-) Thanks for the comment. Hi Madonna, isn't this great? Sweet potato hash is a great idea. Thanks for the comment. Hi Amira, this is a really fun dish, not to mention delish! It's not my usual potato salad, but a nice change of pace. Thanks for the comment. Hi Charlie, I'll bet your uni students would love this! I love roasting sweet potatoes -- such great flavor! I hope you can source the canned chipotles. I just checked and Amazon has them in the US (at a price that's rather high, but not outrageous) but I don't know if they offer them in Australia). Thanks for the comment. Hi Kumar, don't chipotles and sweet potatoes play so well together? Such terrific flavor! Thanks for the comment. Hi Taruna, I hope you do get a chance to try this! And chipotles have such a seductive flavor, that may be enough to entice your family to try it! Thanks for the comment. HI TMF, hope you enjoy it!, Thanks for the comment. Hi Candy, it's really a great combo -- can't get enough of it! Thanks for the comment. Hi Asmita, isn't this nice? I don't make sweet potatoes as often as I should, either, which is why I wanted a dish like this for the summer. Thanks for the comment. Hi Minnie, doesn't this look great? Although the flavor is superb, it's the color I like most of all! Thanks for the comment. Oh yeah! I love the sweet heat flavor in this salad. Perfect for a cook out and as a matter of fact I am going to one on Sunday. Thanks for the recipe! What a great idea - it looks terrific. Hi Karen, this really is a great dish -- I love the heat too! Have a good time at your cookout, and thanks for the comment. Hi Pam, isn't this nice? So much flavor! Thanks for the comment. I can't believe I've never thought of making a sweet potato salad. I love sweet potatoes, and these flavours would be perfect with a barbecue. Enjoy your long weekend! I love sweet potato salad! Adding chipotle is a wonderful idea. A sweet potato salad? I want a big bowl only for myself. 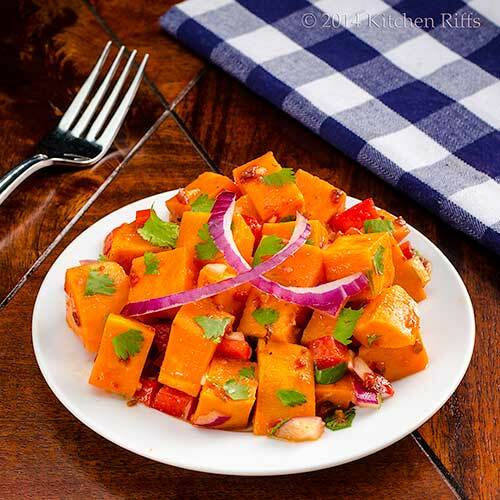 Hi Beth, sweet potatoes work so well in a salad like this -- loads and loads of flavor! Perfect with BBQ. We'll definitely enjoy the long weekend, and thanks for the comment. Hi Laura, aren't sweet potatoes dandy in salad? And the chipotle really is wonderful. Thanks for the comment. Hi Denise, a bowl of one's own is the motto around here. ;-) Thanks for the comment. Hi Carol, isn't the color great? Although the flavor of this is terrific, it's the color I really like. Thanks for the comment. Hi Carolyn, this really is a nice change. Incredibly tasty! Hope you have a great weekend too, and thanks for the comment. I would have never thought of using sweet potatoes in potato salad. Sounds like a great alternative! This recipe is a keeper sounds so yummy! I hope you and Mrs. K R have a wonderful Memorial Day! Hi Dawn, sweet potatoes aren't seen that often in potato salad, but they really work well -- terrific flavor. I hope you have a great Memorial Day too, and thanks for the comment. Lovely idea for a potato salad, great colours too. Hi Caroline, I love the colors on this! And the flavor more than lives up to them. :-) Thanks for the comment. Hi Sherri, if you like chipotle you'll probably like this dish. You definitely taste the sweet potatoes, but the chipotle and lime bring out new dimensions in them. Thanks for the comment. John, you're right about a BBQs and potato salad. But this dish is not only gorgeous, it's packed with terrific flavors. Make it a terrific Memorial Day weekend! I hadn't had sweet potatoes until I landed in the US 7 years ago. Not that they don't grow in India, it's just that they are not indigenous to the region I am from. But Once I did try them, they grew on me. Hot and sweet is just how I like them. I will LOVE this salad. This is exactly the type of salad you'll find on my table--the flavors of lime, hot spices, cumin, olive oil, red onion, Mmmml. Thank you for sharing this. It will be on my table the next time I BBQ. Why not make a potato salad out of sweet potatoes. Wow, what a fantastic combination of flavours, John! I've read that sweet potatoes are also a better choice for controlling blood sugar, so it makes this an even better recipe. Have a great holiday. I have been eating sweet potatoes all my life but haven't thought of making into salad. I love all the flavors in this recipe. The sweetness of the potatoes will match very nicely with the hot spices. Yum! Hi Brooks, this goes soooo well with BBQ! Burgers too, but it really shine with 'Q. Thanks for the comment. Rocquie, chipotle and sweet potatoes really combine exceptionally well, IMO. Have fun with this! Thanks for the comment. Hi Ansh, I think you really will like this salad. I sometimes make a version with Indian spices, which is right up your alley. Thanks for the comment. Hi Mireya, this truly is good stuff -- I think you'll enjoy it! Thanks for the comment. Hi Dawn, if you like sweet potatoes and chipotle, this is definitely worth a try. Loads of flavor! Thanks for the comment. Hi Nancy, I think you'd really like this -- rich, spicy, tasty. Thanks for the comment. Hi Holly, the spices really do work well with the sweet potatoes. Plus it's pretty! A winner in my book. Thanks for the comment. I'm in LOVE with this salad. Sweet potatoes are my friend always but rarely in a salad. Perfecto! Hi Maureen, this really is perfecto! Not to mention awfully tasty stuff. ;-) Thanks for the comment. This is my idea of potato salad. Terrific combination of flavors. I'm not a fan of those heavy mayo based versions. This is definitely pinned for the holiday menu. Hi Kristi, I like the mayo potato salads, but something like this is much more my preference. Loads more flavor! ;-) Thanks for the comment. John I prefer a sweet potato salad but it never occurred to me to add chipotles to the vinaigrette. I love this idea and the flavor of smokey chipotles. I bet the taste truly enchances sweet potatoes. I can't wait to try this and your vinaigrette on other dishes as well. Thanks for sharing. I so wish I could figure out why I'm not getting anyone's posts anymore. It's so frustrating! So behind in my reading.....I thought I had it all planned out, John. I nice quinoa salad of some sort to take to our Memorial Day BBQ at friends....now I just don't know. May have to whip up this delicious sweet potato salad! Hi VIcki, there seems to be some sort of email glitch with feedburner -- a couple of other people have mentioned they're not getting emails either, and I've heard some WordPress blogs are having the same problem. Very weird -- only thing I can suggest is to unsubscribe, then resubscribe and see if that works. (if there's anything I can do at my end I'm clueless about it). Anyway, chipotles and sweet potatoes really are a dynamite combo! Thanks for the comment. Hi Debra, a good quinoa salad is hard to beat! Although Chipotle Sweet-Potato Salad does, IMO. :-) Thanks for the comment. Delicious combination, a wonderful break from traditional potato salad. It's my first time to encounter a sweet potato salad. I'm so used to seeing a lot of potato salads. This is much healthier. Thanks for sharing. Hi Chris, isn't this a fun change of pace? Colorful and incredibly tasty! Thanks for the comment. Hi Peachy, this is such a good dish -- really worth trying. Plus its flavor is out of this world! Thanks for the comment. A wonderful salad and tasty combination! I think this is a devilishly clever idea and why didn't I think of it? But I have to say, I can't imagine eating sweet potatoes cold. Maybe at room temp? I'll just have to try it and find out. Pinned. Hi Cathleen, yeah, "chipotle" gets me every time too! Thanks for the comment. Hi Bam, I'll bet your boys would love this! Tons and tons of flavor. And sweet potatoes really are fairly nutritious, aren't they? Thanks for the comment. Hi Rosa, it's really good stuff! ;-) Thanks for the comment. Hi Lea Ann, they're goof cold, and I'm someone who normally likes most "cold" foods at room temperature. But just put them in a serving dish 20 minutes before dinner, and they'll come to room temperature, or close to it. Thanks for the comment. Hi Karen, hope you enjoy this! I usually dress warm potatoes too, and it certainly works in this recipe. The downside is I find the sweet potatoes tend to break up a bit more than regular potatoes when warm. So I suggest dressing them when cooled. Thanks for the comment. Hi Raymund, this goes sooo well with barbecue! Just a nice pairing. Thanks for the comment. Yummo, sweet potato does make a difference from the ol' white spud. Great recipe, I am definitely putting cilantro (coriander) in our next potato salad, never thought to add it before but I bet its awesome. Hi Liz, I usually use regular parsley with white potatoes, although cilantro is nice too. But when it comes to sweet potatoes? Cilantro all the way! :-) Thanks for the comment. Hi Nami, sweet potato salad and barbecue of any kind is such a great match! This is totally worth making -- I think you and your family will enjoy this. Thanks for the comment. Only looking at the amazing colors of this salad makes me hungry! Beautifuly balanced between sweet & spicy, great job. Hi Daniela, isn't this gorgeous? And totally delish, too. Thanks for the comment. Sweet potatoes always add such a great shot of colour to a table. I think I like the roasted idea for that extra flavour roasting gives. Hope I find some Chipotle Peppers here. Hi Peachy, I know you can order these through Amazon in the US (although they're more expensive than in the grocery store). Whether that option is available to you, I don't know, but it's worth checking. Hi Suzanne, aren't sweet potatoes pretty? Colorful, and such nice flavor. Thanks for the comment. Hi Shibi, isn't this nice? Chipotle works so well in this! Thanks for the comment. Hi Laura, hard to go wrong with chipotle, isn't it? I'm a big fan, too. Thanks for the comment. I love chipotles in adobo and they do pair perfectly with sweet potatoes. I love your idea of making a cold sweet potato salad - I don't think I've ever had them in a cold salad before and it sounds really great for a bar-b-que! Hi Amy, sweet potatoes make an amazing potato salad. And with the chipotle (and that wonderful adobo sauce)? Even better! Thanks for the comment. Sweet potatoes and chipotle peppers are such a great combo! Hi Mary Frances, don't these pair well together? I love the combo! Thanks for the comment. nice to see the chipotle out again! yum! Hi Amy, it's always fun playing with chipotles, isn't it? ;-) Thanks for the comment. Look at those bright colors! And I absolutely love the combination of flavors :) What a great salad! Hi Dana, aren't the colors on this great? And the flavor is wonderful! Thanks for the comment.